All bills at one glance. Convert to Citibank One-Bill to be rewarded! Enjoy a suite of flexible payment options, so that you don't miss out in life! With online payments & transfers, you can forget queue numbers and waiting in line, whilst earning Citi Rewards points and saving your time for the more rewarding things in life. Now you can look forward to more returns every month. Just pay your bills online with your Citibank credit card and we'll reward you with Citi Rewards points, cash back, or PremierMiles*. It's that simple! Pay your bills from your Citibank credit card or Citibank current/savings account, via Citibank Online or Citibank Mobile. Every ringgit used to pay your bills will earn you Citi Rewards points, cash back or PremierMiles*. 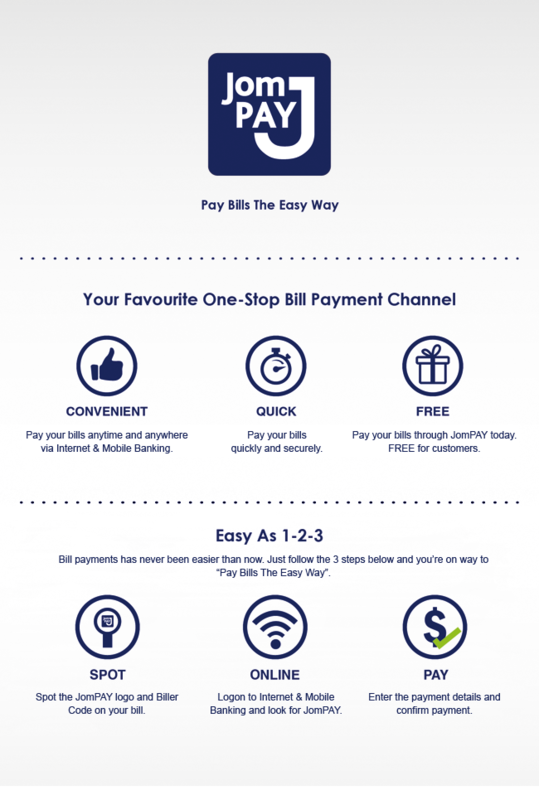 Now you can pay up to 5 bills at one go, without going through the payment process multiple times. Alongside your password and security questions, enjoy additional security with a 2-level authentication, achieved via the use of a One-Time PIN (OTP) which is sent to your mobile. Billers include Tenaga Nasional Berhad, Zurich Takaful, Digi Postpaid and various city councils to choose from, convenience is truly at your finger tips. Supports International Mobile Phone No. Customers who have overseas mobile phone number registered with Citibank will be able to receive the One-Time PIN (OTP) for transaction needs. Debit card ATM PIN or credit card cash advance PIN. * Citibank Rewards Platinum, Citi Prestige, Citibank Platinum, Gold, Silver, Clear, Choice and CitiBusiness (personal underwriting) cardmembers earn Citi Rewards points, AirAsia cardmembers earn AirAsia Points, while Cash Back Platinum, Giant and Shell cardmembers earn Cash Rebates. This Online Bill Payment, Mobile Bill Payment and Mobile Prepaid Reload Services enables me to make payments or reloads to specified Payee(s) by electronic means via the use of my Customer Terminal. The Services is available to me, whether an existing customer of the Bank or not, subject to the Bank's conditions, limits and procedures whether contained in these Terms and Conditions or as prescribed by the Bank from time to time at your absolute discretion. These Terms and Conditions govern my rights and obligations, as the customer, and yourselves, the Bank, in connection with the access and use of this Service. By accessing http://www.citibank.com.my or using this Service, I HEREBY ACKNOWLEDGE AND ACCEPT that my access and use of this Service shall be governed by these Terms and Conditions. In the event of any inconsistency or conflict between the Bank's general rules, procedures, terms and conditions as determined from time to time, AND these Terms and Conditions, these Terms and Conditions shall prevail unless specifically provided otherwise. "Agreement" or "this Agreement" means these Terms and Conditions, and wherever applicable, shall include (i) any rules, procedures, terms and conditions for this Service, as determined by the Bank from time to time and (ii) any documents, directives, correspondence and agreements referred to in these Terms and Conditions and made a part thereof, together with any amendments made from time to time to any of the foregoing. "Business Day" means any day which banks in Malaysia are open for business. "Customer Terminal" means any computer, mobile phones or other devices (including PCs, notebooks, laptops, personal digital assistants, etc.) from which I access and use the Services from time to time. "Exchange Control Regulations" means the Exchange Control Act 1953 (Revised in 1969), the Exchange Control Rules and any and all guidelines and/or regulations issued by Bank Negara Malaysia on exchange or currency controls from time to time. "MasterCard International" means MasterCard International Inc, 2000 Purchase Street, Purchase, NY 10577-2509, USA. "my Account" means any and all of my account opened and maintained with the Bank, (whether alone or jointly with any other person(s) and whether current, deposit, loan or otherwise which Account may be used by me as a means of payment for purchases of and charges relating to the Payee's goods and services. "my Card" means my validly issued and unexpired VISA credit bearing the VISA logo and/or any relevant service marks licensed by VISA International or my validly issued and unexpired MasterCard credit bearing the MasterCard logo and/or any relevant service marks licensed by MasterCard International, issued by any bank, financial institution or corporation with my name and Card or Card Account number imprinted or embossed on the Card, which Card may be used by me as a means of payment for purchases of and charges relating to the Payee's goods and services. "Online Bill Payment Service" or "Online Service" means the online bill payment service made available by you through the Website for the payment of bills to Payee(s) using my Card or my Account in accordance with and subject to the terms and conditions of this Agreement. "Mobile Bill Payment Service" or "Mobile Service" means the mobile phone bill payment service made available by you through the mobile phone SMS instructions and short code for the payment of bills to Payee(s) using my Card or my Account in accordance with and subject to the terms and conditions of this Agreement. "Mobile Prepaid Reload Service" or "Reload Service" means the mobile phone prepaid reload service made available by you either through the Website or mobile phone SMS instructions and short code for the reload of prepaid credit to the registered mobile phone number(s) using my Card in accordance with and subject to the terms and conditions of this Agreement. "Payee" means a vendor, merchant, biller, person, corporation or entity whose names are set out in the bill payment section of the Website and whose bills or Reload Service can be paid through the Services. "Payment or Reload Instruction(s)" means the requests made and particulars given by me to you to effect payment or reloads to the relevant Payee(s) in accordance with the procedures and prompts set out in the Services under the Website. "Services" mean collectively the Online Bill Payment Service or Online Service, the Mobile Bill Payment Service or Mobile Service and Mobile Prepaid Reload Service or Reload Service. "Response" or "respond" means any positive confirmation, non-acceptance, acknowledgement, rejection, cancellation or reply by the Bank to any Payment or Reload Instruction. "SMS Instructions" means my Payment or Reload Instructions made through the mobile phone short messaging system send to the Short Code. "Short Code" means Citibank SMS short code number 36700 where I will use it to send you my Payment or Reload instructions. "these Terms and Conditions" means these Terms and Conditions governing access and use of the Online Bill Payment Service, Mobile Bill Payment Service, or Mobile Prepaid Reload Service as amended from time to time. "Use of "the Services" means any access and/or use of the Online Bill Payment Service, Mobile Bill Payment Service and / or Mobile Prepaid Reload Services on or through the Website or my mobile phone. "VISA International" means VISA International Inc, P.O. Box 8999, San Francisco, CA 94128-8999, USA. Use of the terms "the Bank", "you", "your", "yourselves" and "yours" refer to Citibank Berhad, 165 Jalan Ampang, P.O.Box, 50450, Kuala Lumpur. Use of the terms "I", "me", "my", "mine" and "myself" refer to the person(s), corporations or entities and who has or have been issued and holds a valid VISA or MasterCard credit card, and for the avoidance of doubt, shall include corporations or entities who authorise persons or agents to hold a valid VISA or MasterCard credit card for and on behalf of the corporations or entities. For all payments using the Services, you will endeavour to process my Payment or Reload Instructions in accordance with my Payment or Reload Instructions. However I understand and accept that payments under the Services may not be completed or may be deleted for any reason(s) whatsoever. I accept that the Bank makes no warranty that any of my Payment or Reload Instructions will be completed within a particular time period or date or that payment will be properly made to the relevant Payee(s) in accordance with the Payment or Reload Instructions. Any questions on the status of my Payment or Reload Instructions shall be directed via the contact details provided at the Website. In the meantime, I shall not repeat the Payment or Reload Instructions for payment of the same bill. It is my responsibility and not the Bank's to ensure that prompt payment is made to the relevant Payee. The Bank shall not be held liable or responsible to me or any third party for any delays or failure to make payments or reloads to the Payee(s). All payments made and fees, charges or other costs and expenses incurred hereunder, whether direct or indirect, as a result of my Payment or Reload Instructions or otherwise resulting from Use of the Services shall be debited into my relevant Card account or my Account, as the case maybe and payment made by me according to the relevant Card's or Account?s terms and conditions. Payment for any amounts incurred hereunder by me (including returned payments, disputes on amounts, etc.) as a result of the use of my Card or my Account shall be dealt with and resolved in accordance with the relevant Card's or Account?s terms and conditions. I confirm that you shall not be responsible in the event of the Payee failing to refund any moneys on my request and my sole and exclusive recourse shall be against the Payee only. I further confirm that in the event of any dispute with the Payee [or the Card-issuing bank, financial institution or corporation], I shall not make you a party to the dispute. One Bill is your one-stop enrollment service for recurring bills to be auto-debited from your Citibank credit card. It combines your bills from participating merchants into one credit card statement, ensuring that you never miss a payment. Consolidate recurring bills for major services to your Citi credit card, including Tenaga Nasional Berhad, Digi, Zurich Insurance Malaysia and more. Your credit card rewards you when you spend, and that includes settling your bills! Every ringgit used to pay your bills will earn you Citi Rewards points, cash back and PremierMiles. Enrollment requires only a one-time registration, which can be easily done anytime - 24 hours a day, 7 days a week. As used herein, the word "Card" means all credit cards issued by Citibank Berhad ("Citibank and "cardmember" means the holder of a Card who is selected and invited by Citibank to participate in the Citibank Online One Bill Service ("the Service"). The terms and conditions herein are to apply in conjunction with the "Citibank Credit Cards, Card Agreement" mutatis mutandis. In the event of any discrepancy or inconsistency between this agreement and the "Citibank Credit Cards, Card Agreement", the terms of this agreement shall prevail insofar as they apply to the One Bill Service. Save for words pre-defined herein, the words and expressions used herein shall have similar meanings as in the "Citibank Credit Cards, Card Agreement". Upon approval of the cardmember's application to be enroled for the Service by Citibank, all amounts due and owing ("Charges") to the merchant(s), indicated by the cardmember upon enrolling for the Service ("Merchant") shall be charged to the cardmember's Card account maintained with Citibank ("Credit Card Account"). The cardmember's previous instructions to the Merchant(s) to charge the said Charges to the cardmember's credit or charge card account maintained with other credit or charge card issuer is to be treated as revoked and the cardmember shall be obliged to notify the credit or charge card issuer in writing of the said revocation. If any Merchant shall respond to Citibank that it does not recognise the instructions given by Citibank, the affected cardmember shall immediately notify the Merchant in writing of the change in the paying instructions. If the cardmember has previously signed up for any auto-billing or online bill service with respect to the Merchant indicated by the cardmember prior to enrolling for this Service, the cardmember warrants and undertakes to ensure that such previous auto-billing or online bill service is terminated or cancelled and Citibank shall not in any way be liable or responsible in the event such previous auto-billing or online bill service is not terminated or cancelled for any reason whatsoever. Although Citibank will endeavour to effect payments of the said Charges, it accepts no responsibility to make the same at any time or in a timely manner, and Citibank shall not incur any penalty, interest and liability to the cardmember through any error, neglect, refusal or omission to make or delay in making all or any of the said Charges to the Merchant. Citibank shall use its best endeavour to effect the cardmember first One Bill transaction not later than twenty (20) days following the date of Citibank's approval of the cardmember's application for enrolment for the Service and such transaction shall be billed to the cardmember's Card Account on the next statement date save and except for transactions involving local councils as such transactions shall be governed by Clause 10 herein below. Without prejudice to Clause 2 & 3, Citibank shall not be responsible for making all or any of the said Charges to the Merchant(s) where the use of the Card by the cardmember is terminated or suspended for any reason whatsoever in which event the cardmember shall be responsible for paying the said Charges directly to the Merchant. Citibank shall not be obliged to inform the cardmember regarding non-payment of all or any of the said Charges to the Merchant. If there is no available credit limit in the cardmember's Credit Card Account or if the available credit limit is insufficient to make payment of the said Charges to all or any of the Merchant and Provided that the cardmember has agreed to the alternative card option in the application form for the Service, Citibank will, without prejudice to Clause 7 & 15 herein, select the alternative card of the cardmember which the cardmember have indicated in the said application form to make payment of the Charges. If the alternative Card option is not applicable or the alternative card chosen does not have sufficient available credit limit, Citibank may at its sole and absolute discretion (which discretion shall not be questioned) elect not to make any payment of the said Charges to all or any of the Merchant, in which event the cardmember shall be responsible for paying the unpaid said Charges directly to the Merchant. The alternative card feature in Clauses 5 is only available for the principal card, and not valid for the supplementary card. In the event that the cardmember obtains a replacement card for reasons of fraud, replacement of lost, stolen or damaged card, renewal of expiring card or upgrading of existing card, Citibank shall ensure that the instructions for the Service shall be transferred to the replacement card to ensure the non-interruption of the Service. To be eligible for the Service in relation to bills issued by Tenaga Nasional Berhad, the cardmember average bill for the last 6 months from date of enrolment of the Service with Tenaga Nasional Berhad shall be no more than RM5,000. Application for enrolment for or a notice of termination by the cardmember (where such notice of termination must be made either in writing or via phone) of the Service for local council transactions must be received by Citibank on or before 15 December in order to be effective for assessments payable in February of the following year or on or before 15 June in order to be effective for assessments payable in August of the same year . In the event such application or notice of termination as hereinbefore stipulated is not received by Citibank on or before the dates stipulated herein, Citibank shall not be liable or in any way responsible for any payment effected to any local council under the Service. These Terms and Conditions will remain effective in respect of the said Charges made in good faith notwithstanding the cardmember's death or bankruptcy or the termination by the Merchant of the provision of services to the cardmember ("the Termination") until actual written notice is received by Citibank of the cardmember's death or bankruptcy or the Termination. In consideration of Citibank agreeing to provide the Service, the cardmember undertakes to indemnify Citibank against all losses, costs, damages, expenses, claims and demands which Citibank may incur or sustain as a result of the provision of the Service. Citibank shall not be responsible for any acts or omissions on the part of the Merchant or for any defect or deficiency in the services provided by the Merchant. Any complaint or dispute by the cardmember must be resolved directly with the Merchant at the cardmember own cost and expense and no claim against the Merchant may be set-off or counter-claimed against Citibank. The cardmember shall not withold payment to Citibank on account of any such complaint or dispute or under any circumstances whatsoever. The cardmember must inform Citibank via CitiPhone of changes in credit card type (i.e. change from Visa card to MasterCard and vice versa). For any replacement to the card as a result of lost, fraud, or upgraded, Citibank will charge the said Charges to the replacement card. Supplementary cardmembers are eligible to enrol for the Service unless otherwise objected by the Principal cardmember in writing. Save and except for a termination of the Service by the cardmember for local council transactions governed by Clause 10 hereinabove, either Citibank or the cardmember may terminate the Service by giving to the other party not less than one month's notice in writing or via phone. Termination of the Service shall not terminate the Credit Card Agreement between Citibank and the cardmember. In the event the Credit Card Agreement between Citibank and a cardmember is terminated by either Citibank or the cardmember, the Service and Citibank agreement to make payment to the Merchant under the Service shall immediately terminate. The cardmember authorises Citibank to disclose to the Merchant from time to time information relating to the cardmember and expressly consents to such disclosure and confirms and declares that no further consent from the cardmember is necessary or required in relation thereto and Citibank shall be under no liability for disclosing such information. Notwithstanding the Service herein, all terms and conditions existing between the Merchant and the cardmember and the obligations of the cardmember therein contained shall continue to be binding between the Merchant and the cardmember. The Service is made available to you subject to the terms and conditions herein and all laws, regulations, directives and guidelines governing the Card. The Terms and Conditions herein contained shall be governed by and construed in accordance with the laws of Malaysia and the cardmember agrees to submit to the non-exclusive jurisdiction of the Courts of Malaysia. The Terms and Conditions herein governing the use of the Service shall apply to the Principal cardmember and the Supplementary cardmember. Transfer funds locally and overseas from the comfort of your home, with a simple and secure hassle-free process. Security is ensured, as all online transactions require a One-Time PIN (OTP) which is sent to your mobile. For greater peace of mind, you'll also receive a confirmation alert after the transfers are executed. Enjoy low Interbank GIRO transfer fees of only RM0.10 for each transfer. Note: This will be waived (effective 24th March 2015) until further notice. Schedule future dated and recurring transfers for your convenience. A One-Time PIN (OTP) will be sent to your mobile for all online transactions, which you will be required to enter to proceed. Instant funds transfer between your own or other Citibank Malaysia account. Inward transfer gives you convenience and better security as you do not need to perform physical withdrawal of funds from participating banks within the Interbank GIRO network. All you need is either a savings or checking account to transfer your funds. No minimum transaction amount for Interbank GIRO transfer. Daily combined limit for Interbank GIRO transfer via OTC is RM1,000,000. 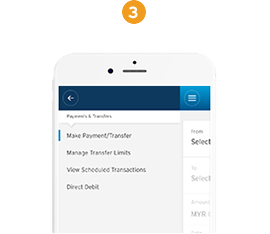 Daily combined limit for fund transfers via Citibank Online Banking, Citibank Mobile Banking, CitiPhone banking and MEPS ATM is RM 50,000 for Citigold and Citibanking customers. Actual crediting time is subject to the individual Corresponding Bank's daily cut-off time. A free and convenient solution, DirectDebit allows you to automatically debit your funds from other local banks to your local Citibank checking or savings account, and is especially useful for recurring transactions. Learn more. 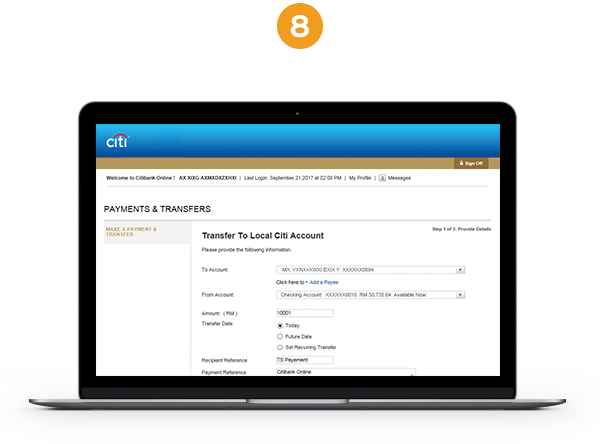 You can now transfer funds from one account to another in real time, with no waiting period via Citibank Online! A Citibank savings or checking account with Citibank Debit and ATM Card Pin number. For Citibank Account Terms and Conditions, click here. Please visit www.jompay.com for more information. 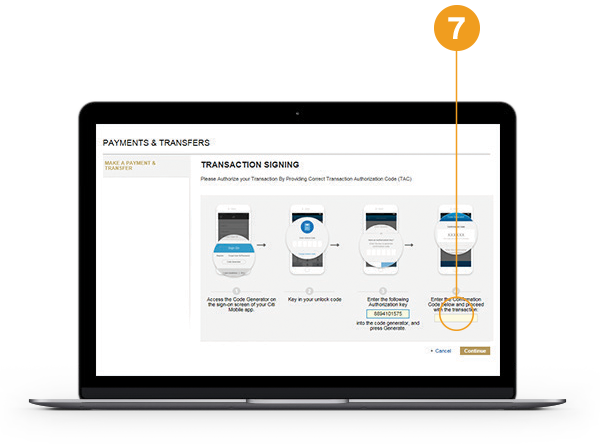 Once you’ve entered your transaction details, click on MAKE THIS PAYMENT and you will be directed to the Transaction Signing Screen. 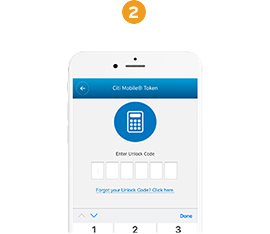 You will see a 10-digit Authorization Key which is to be entered into your Citi Mobile® Token on the Citi Mobile® app. 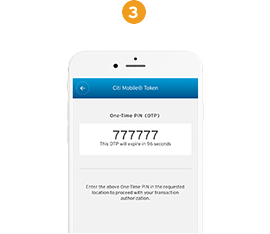 Tap on GENERATE ONE-TIME-PIN (OTP) on the Citi Mobile® app Sign On Screen. 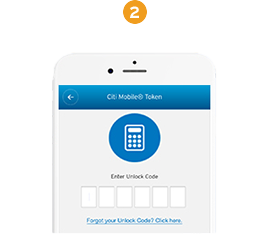 Note: If you do not have Citi Mobile® Token enabled, tap on “Enable Citi Mobile® Token” and follow the steps required. 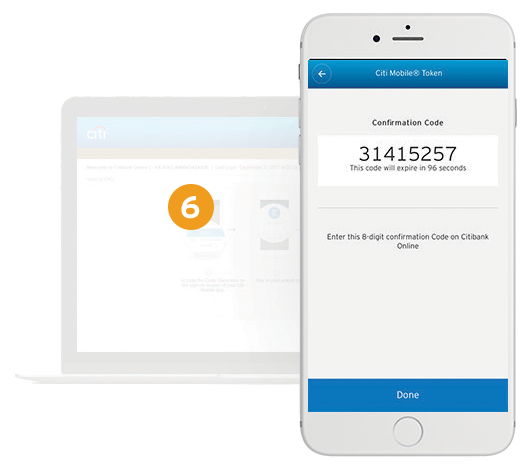 Enter your Citi Mobile® Token 6-digit Unlock Code. Enter the 10-digit Authorization Key which you have obtained from Citibank Online into the “Have an Authorization Key” field and tap on GENERATE to receive your 8-digit Confirmation Code. The 8-digit Confirmation Code will be generated which is to be entered into Citibank Online. Note: Please do not click “DONE” if you have not entered your Confirmation Code into Citibank Online. Enter the 8-digit Confirmation Code retrieved from Citi Mobile® app and click CONTINUE. Your transaction is now complete! 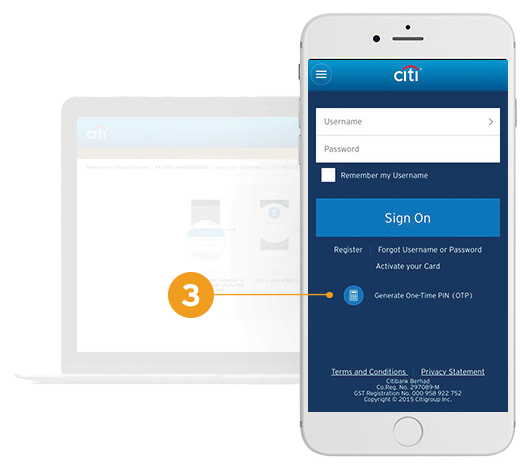 With Citi Mobile® Token feature on your Citi Mobile® app, you can now authenticate all your online banking transactions securely, easily and instantly. 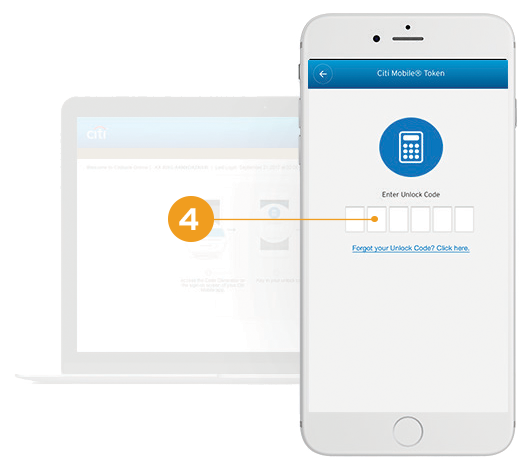 You no longer have to wait for a One-Time-PIN (OTP) via SMS. 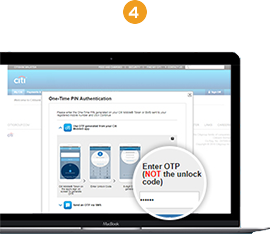 Enter your 6-digits Unlock Code to automatically generate a One-Time-PIN (OTP). The One-Time-PIN (OTP) will be generated and authenticated instantly without you having to key it in. 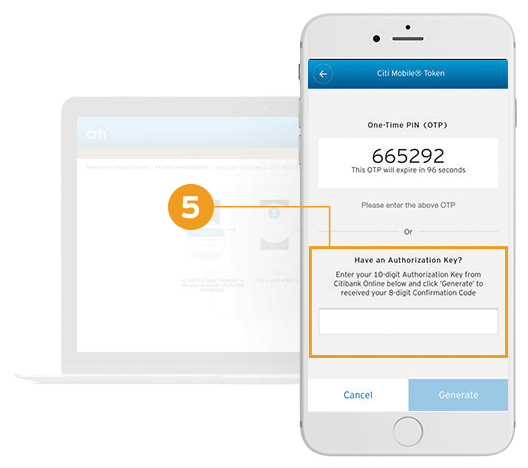 When prompted for One-Time-PIN (OTP) Authentication, select "Use OTP generated from your Citi Mobile® app" and follow the steps below. 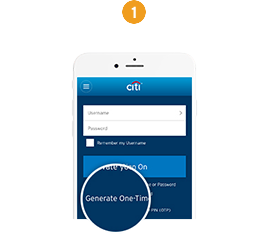 Click on "Generate a One-Time-PIN (OTP)" on the Citi Mobile® app login screen. Enter your 6-digits Unlock Code to automatically generate a One-Time-PIN (OTP) when prompted. One-Time-PIN (OTP) will be generated instantly. Key in the unique One-Time-PIN (OTP) that was generated in the "ENTER OTP" slot to proceed with your transation. DuitNow allows you to send funds instantly and securely to mobile numbers, NRIC numbers or business registration numbers, known as DuitNow ID. Each individual’s DuitNow ID is linked to their respective bank account. 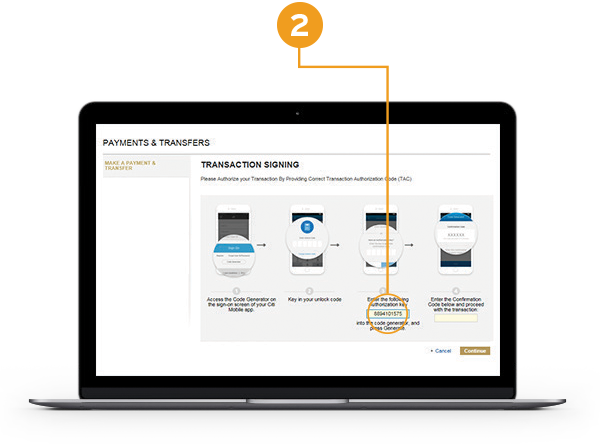 Transferring funds can now be done conveniently without the need to remember account numbers! Log on to Citi Mobile or Citibank Online. If you are on Citibank Online, proceed to the Payment and Transfer page. Select DUITNOW from the menu, then click on Manage DuitNow ID. Choose an ID type from the displayed list, then click on Register. Choose which Citibank account you want to link your DuitNow ID to. 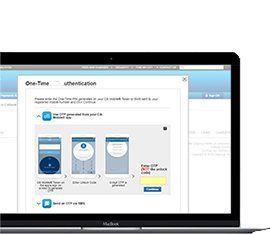 Click here for a step-by-step guide on setting up your DuitNow ID. DuitNow is a new way to send and receive funds instantly and securely to mobile numbers, NRIC numbers or business registration numbers, known as DuitNow ID. Each individual’s DuitNow ID is linked to their respective bank account. 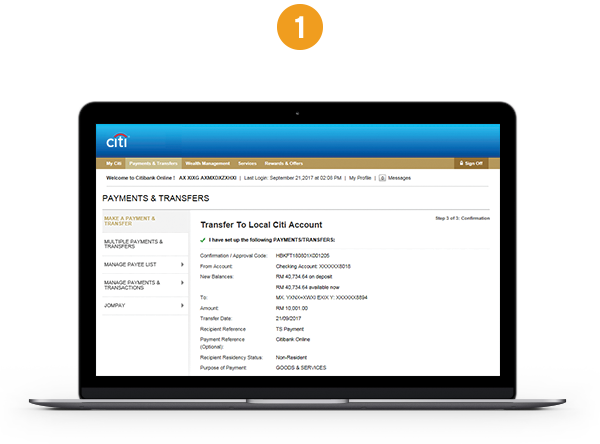 DuitNow transactions can be performed on both Citi Mobile and Citibank Online. This is an initiative by PayNet, Malaysia’s national payment systems operator, to transform the payment landscape in Malaysia for enhanced convenience. Will Citibank’s customers be pre-registered for DuitNow? Please note that Citibank will not be pre-registering our customers for DuitNow. However, customers may proceed to register for DuitNow on Citi Mobile or Citibank Online once DuitNow is available. What should I do if I would like to register for DuitNow with Citibank, but have been pre-registered by another bank? If you have been pre-registered for DuitNow with a different bank, simply register your DuitNow ID with Citibank to switch over. This can be done via Citi Mobile or Citibank Online once DuitNow is available. Alternatively, if your mobile number had been pre-registered with a different bank, you may also choose to register for DuitNow with Citibank using your NRIC. Do I need to register to use DuitNow? Registration is not required to send funds via DuitNow. However, if you would like to receive funds via DuitNow, you will need to register for a DuitNow ID. What is a DuitNow ID? DuitNow IDs are the registered IDs linked to your bank account. The registered IDs can be your mobile number, NRIC number or passport number. How many DuitNow IDs can I register for? You can register for multiple DuitNow IDs. However, each ID that you will use to register for DuitNow, such as your mobile number, NRIC number or passport number, can be linked to one account only. Which Citibank accounts can I link my DuitNow ID to? DuitNow IDs can only be linked to checking accounts and savings accounts. Can I link two DuitNow IDs (such as mobile number and NRIC number) to the same account? Yes, you may link two DuitNow IDs to the same account. Can I link two DuitNow IDs (such as mobile number and NRIC number) to two different accounts within Citibank? Yes, you may link two DuitNow IDs to two different accounts within Citibank. For example, you have one current account and one savings account in Citibank. You can link your mobile number to your current account and NRIC to your savings account. Can I link two DuitNow IDs (such as mobile number and NRIC number) to two different accounts in two different banks? Yes, you may link two DuitNow IDs to two different accounts in two different banks. For example, you have one account in Citibank and one account in Bank Alpha. You can link your mobile number to your account in Citibank and NRIC to your account in Bank Alpha. Can I change the account that was linked to a DuitNow ID? Yes, you can change the account linked to a DuitNow ID through Citi Mobile or Citibank Online once DuitNow is available. Are there any fees or charges to use DuitNow? DuitNow is complimentary to all Citibank’s customers. Is there a limit on DuitNow transfers? The transfer limit for DuitNow is RM50,000. However, this is a shared limit across all fund transfer services via Citi Mobile, Citibank Online, CitiPhone and MEPS ATM. If you have registered, click here for a step-by-step guide on transferring fund using DuitNow. For DuitNow Terms & Conditions, click here. For National Addressing Database Terms & Conditions, click here.